Did anyone cross-shop CX-5 with the new Tiguan? Thread: Did anyone cross-shop CX-5 with the new Tiguan? I'm lining up test drives for a new compact crossover and the CX-5 turbo is at the top of my list, but the new Tiguan caught my eye when I noticed that the dealerships in my area (DC) advertise an up front discount of 15% off MSRP, meaning I can get a maxed out 2019 for under $35k. I never considered VW in the past because I didn't really like their utilitarian style. However, for a boxy SUV, I think the new Tiguan looks pretty rich with the R-Line package. I've done some research and the top complaint is an underpowered engine, which is frankly a universal gripe for 95% of today's crossovers and doesn't turn me off of test driving one. The interior is not memorable, but has the snazzy Audi virtual cockpit, all of the amenities I desire except for cooled seats, and offers a light gray interior color option (similar to CX-5's parchment, which I love). Did anyone here cross-shop the new Tiguan with the CX-5? If so, what made you choose the CX-5? Thanks! I did. As soon as the test drive began, the comparison ended. We didn't want another under-powered SUV after driving our 2010 CR-V for 8 years. If you can live with that, you should definitely check it out. The warranty is nice, too. Long time vw/audi owner as well. The tiguan was the only other car we looked at vs the CX5. The Tiguan is nice, especially with that new warranty. If they brought the short wheelbase model and had more engine options, we probably would've gone with the tiggy (the R-line looks great, but $$$). I feel that both cars are underpowered but I haven't driven the new CX 2.5 turbos. I suggest you test drive each one right after the other. Pretty happy with the CX so far, didn't see the need for a 3rd row and the price point for the specs was a bit lower (touring with preferred package). I bought a SWB 190ps Tiguan SEL after two test drives and 5 years with a cx-5 175ps diesel. Paid around the same price as I would a cx-5. Went from a 2009 CRV, i to was sick of underpowered cars. Test drove everything, CX5 turbo stands out from the crowd. Great overall car already but the power of the turbo makes it really scoot. I have a 2017 Golf R so I wanted to love the Tiguan but its engine is just so lacklustre, and VW quality is iffy at best right now. I did. Test drive them both and more than once if possible to get a real feel of where you are most comfortable with. As mentioned by others, one issue might be the engine lack of power in the Tiguan. I am very sorry to hear that the new Tiguan now has an anemic engine. A few months ago I traded my 2016 Tiguan for my current 2018 CX-5. My Tiguan had the 2.0 with a Turbo and was very peppy. I miss that power with my CX-5 but love every other aspect of the CX-5. Plus, it is a much better looking vehicle than the Tiguan. The CX-5 is a much quieter vehicle also and I was able to get more vehicle for my money by not going with VW again in spite of the fact that I purchased the full bumper to bumper warranty that covers the CX-5 for 6 years or 100,000 miles. Don't get me wrong, my 2016 Tig was a good vehicle that I had no problems with during ownership. I just happen to like the CX-5 more and I am getting considerably better gas mileage by not having that turbo. Actually, I am getting used to having less power with the CX-5 but in your case, you will be getting a 19 CX-5 with the turbo. No power loss there, just a bit of a gas mileage hit. Last edited by David Paul; 02-11-2019 at 01:44 AM. 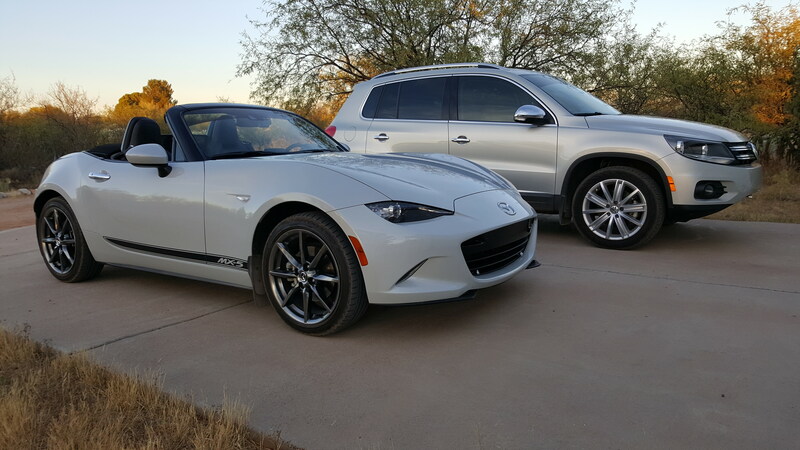 2018 CX-5 Grand Touring Snowflake White Pearl----2016 MX-5 GT Soft Top Ceramic White Metallic. The Tiguan with 2.0T turbo engine is about as fast off the line as a 2018 CX-5 with 2.5l engine. No comparo vs the CX-5 turbo. Switched from VW to Mazda a few years back. Benefits I miss from VW include better paint quality, a solid chassis/planted feel, bit better dealership experience. Long term VW ownership maintenance = over maintenance on a Mazda imho. (DSG servicing, bulbs going out, electrical gremlins, TSBs, ect.). Maybe its the angle of the shot but the proportions looks so off on that. Ugly AF. The new Tiguan, does not have an ECU tune? That’s the outgoing model. Here’s the new one that I’m taking about. Huge difference. Don’t even need a pro tune. Apparently changing the throttle response setting from default to “direct” makes a big difference. That*s the outgoing model. Here*s the new one that I*m taking about. Huge difference. I really like the styling of that, would have it it up there with the CX-5 at the top for this vehicle class where there is lots of bland/ugly to be found.